Thank you for taking time to read through this annual review of 2012’s activities and its partial list of YOUR accomplishments. 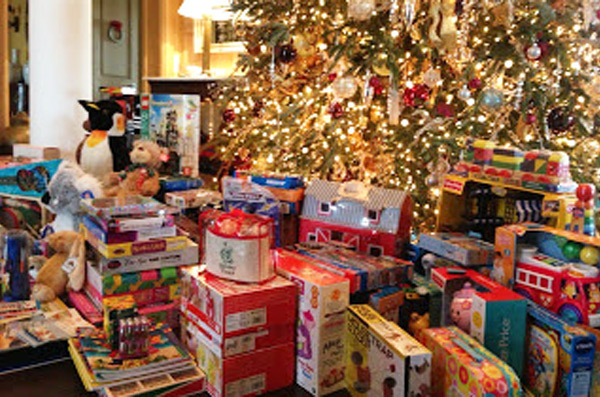 We could not report on all of the good deeds performed in 2012, but we thank you ALL for your enthusiasm, your willingness to learn the issues, to spread the word, and to contribute small and large blocks of time, energy and money to help the children. Reflecting back on 2012, we are awed by the POSITIVE energy of the wonderful people we have encountered, including volunteers, students, teachers, authors, journalists and members of the Pine Ridge community. Although there are signs of progress coming from the federal government, and grass roots advocacy efforts are expanding, many Americans still have no idea that there are communities in the United States that do not have access to proper educational support, plumbing, water or the Internet. Similarly, many are unfamiliar with the appalling statistics of violence against American Indian women. • 1 of 3 will be raped, 85% by non-native men. • Native women are 10 times more likely to be murdered than other ethnic groups, and there are barriers to prosecution of non-native perpetrators on reservations. • On Pine Ridge, reported High School graduation rates are low and the NIEA reports that the graduation rates for American Indians and Natives across the country present a State of Emergency. Through social media and our Blog we have tried to keep you informed about the events of the year. 2012 presented a renewed discussion about the use of mascots, costumes depicting American Indians in a disparaging manner and the use of regalia and ceremonial headdresses. An Atlanta team added what appears to be a “screaming Indian” to its hats, the GAP released “Manifest Destiny” t-shirts and Victoria’s Secret headlined a model dressed almost exclusively in a ceremonial headdress. South Dakota schools experienced hate crimes directed against American Indians, while suicide rates among American Indian youth remained disproportionately high, and mental health services were nonexistent in some communities. In September of 2012 United Nations human rights expert James Anaya reported that the United States has not fulfilled its human rights obligations to America’s first peoples, and that its continued failure to take reconciliatory action puts its credibility in jeopardy as the United States makes humanitarian demands of other nations. The report also concluded that the public at large and many government officials are not adequately educated about the issues facing indigenous communities. These findings were covered extensively by the foreign press, but not by the mainstream press here at home. 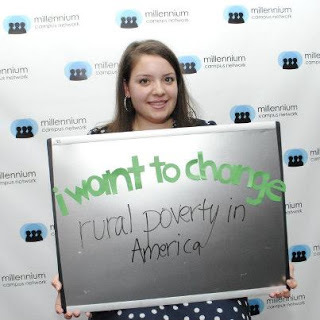 Addressing rural poverty in America, and helping to strengthen the voice of our continent’s first inhabitants, (whom combined represent only 1.7% of the population), present challenges that cannot be fixed by soup kitchens, homeless shelters, tutoring services and an occasional newsletter. Without a doubt, there is a need for aid, but equally important, there is a need for pervasive social change and reconciliation. 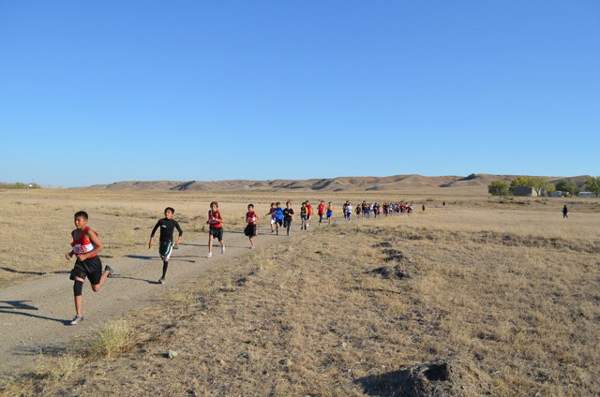 The obstacles faced by the Lakota on Pine Ridge Reservation do not stand in isolation. Although our aid efforts are limited to Pine Ridge, LCE is about helping to strengthen the voice of America’s first inhabitants, acknowledging and reconciling inequities through education of the public, and breaking down hurtful stereotypes and barriers. We shortened our name to Lakota Children’s Enrichment, Inc., rather than the longer Lakota Pine Ridge Children’s Enrichment Project, Ltd. Thanks to the continuing support from the Pro Bono Partnership, a group of lawyers who donated their time to the project, the transition went smoothly and quickly. We also amended our bylaws this year to better define duties and to permit us to add an Advisory Board. With a huge assist from graphic designer Derek Li, we have a new logo! Our logo draws its inspiration from the Oglala Lakota flag and incorporates two significant symbols in Lakota tradition: the circle and the tipi. Together, they represent family, unity and the warmth of the sun. The eight tipis surrounding the circle stand for the Pine Ridge Reservation’s eight districts. Thank you Derek for your thoughtful work. We launched three new projects this year. First is our First Annual Writing Challenge, exclusively for the students on the Pine Ridge Reservation. 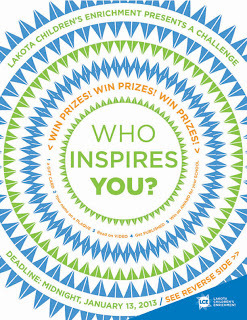 We have challenged High School and Middle School students to tell us about a woman on the Pine Ridge Reservation who inspires them by writing a letter or poem. This contest is ONLY open to residents of Pine Ridge and allows students to win prizes for themselves AND their schools. We also implemented a new pilot program, Pen-Pal Plus, which links elementary schools on and off the Pine Ridge Reservation through video discussions, technology and special projects. Our goal is to educate students on and off the reservation about cultures and traditions, to break stereotypes and to build inter-cultural relationships. This is a year-long pilot program and we will report back with complete results, but so far it has been positive for both sides of the dialogue. Also new in 2012, we were approved to be a President’s Volunteer Service Award organization. What that means is that YOU, your team members, your school group, your civic group can track your hours and earn awards when you volunteer your time on one of our projects, or one of your own projects you create to help us! Our Organization Code is kSFHSZ, so register, log on and earn awards! In February, an affiliated student group at Colgate University, Project PEACE, and numerous academic departments brought Inila-Wakan Janis from Pine Ridge to Colgate University to speak about social justice and the Lakota. At the request of our Facebook Fans, we reported on this event on our blog. We Are All Under the Hoofs of Injustice:The Journey Towards Social Change for the Lakota. Janis shook it up with a standing room only brown bag presentation on the 1970’s Wounded Knee Uprising and then a packed evening lecture which focused on the Wounded Knee Massacre of 1890. Janis’ overarching message to students was to be socially conscious members of society, to take action to protect the environment and to address social change through collective actions that transcend cultural divides. In April, Education major Kelsey John blogged about her experiences on the Pine Ridge Reservation and the importance of disposing of educational biases to insure that elementary school students of all ethnicities obtain an enriched education. See Reservations About Education: The Importance of Early Childhood Education. This reflection is particularly timely in view of the recent NIEA report declaring an Education State of Emergency for Native American, Alaskan Native and Native Hawaiian children. See A State of Emergency for American Indian and Native Children. We also published a blog post on the United Nations Report on the State of Indigenous Rights in North America. In the opinion of a human rights expert James Anaya, our nation needs to do more to help its first peoples. 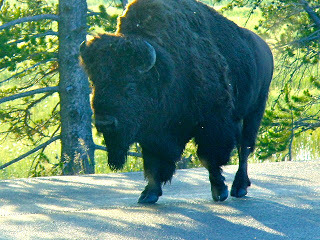 See: The Bison in the Living Room: Why Isn’t the UN’s Report Front Page News? We urge you to read the report and educate your friends, families and educators. Maggie Dunne spoke at numerous schools and events throughout the year. In September, Maggie was featured as a Keynote Panelist at the Millennium Campus Conference at Northeastern University and spoke to a crowd of 1200 college students about the importance of addressing domestic poverty. In 2012 we started a Twitter Account and so far have gathered over 1000 followers. 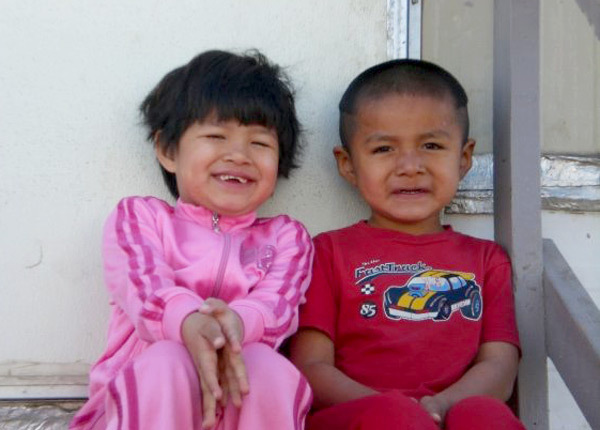 Our Twitter handle is @Lakota_Children so please follow us there, too! We post and re-tweet articles of interests relating to indigenous rights around the world and we distribute a broader range of information than we do on our Facebook Page. Our Facebook Page has continued strong and we now have over 4200 fans and many more followers. Facebook analytics report that in some weeks we had more than 2,800 deliberate visitors to our page who, in turn, generated stories that were viewed by over 22,000 people. In other words, even with the new Facebook promotion policies that prevent us from reaching all of our fans unless we pay to advertise (the nerve), our fans are helping us reach lots of people. We also launched new BLOG features, including posts highlighting some of the inspirational actions of our fans, a series we call “Spotlight On:” and this year we published our first profile of a resident of Pine Ridge. Please contact us at info@lakotachildren.org if you would like to publish a guest blog and we may publish your work! We continued our supply drives and particularly focused on providing new items for school partners. In the Spring we held our annual Fill A Backpack Drive and with the help of students from Colgate University we distributed over 100 backpacks, 60 calculators, 30 scientific calculators, school supplies, sneakers and books toppling the scale at over 1000 pounds from New York alone and again, our Facebook Fans sent an equal amount. We also sent the toys we collected from the Spring drive to Wanblee, along with plastic eggs and treats, for our 3rd annual Spring Egg Hunt. For the 5th year in a row, we ran a Fall coat, boot and book drive which we registered with USA Weekend’s Make A Difference Day and on Facebook. Every year we report that this effort was even greater than the past year because IT IS TRUE! This year we were surprised by the truly creative ways that people found to engage their friends, to educate, and encourage friends to participate in any way possible. Among many noteworthy efforts, teens in Scarsdale, New York, organized a car wash, bake sale, auction, a capella afternoon event that raised $1300 in four hours! There was no cover charge, but everyone was asked to bring a new coat or pair of boots for us to send to the Reservation. We also heard from shop owners who put up boxes to collect donations, people who donated their birthday parties and asked friends to bring coats, boots or checks. 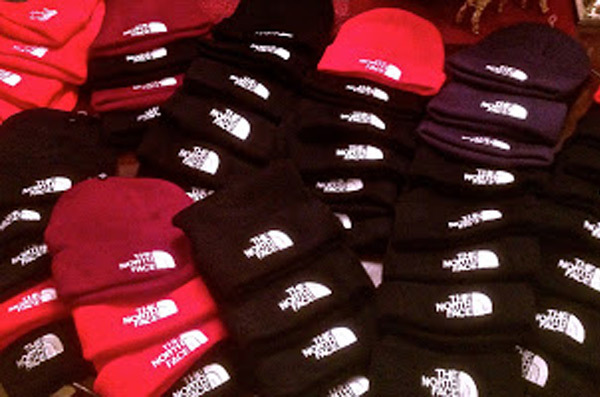 Others knit or crocheted hats, scarves and mittens. A big surprise came in the book department: a library association provided us with approximately 3,000 barely touched children’s books, a retiring teacher gave us all of her teaching materials, a Womens Club offered a great selection of hundreds of hard cover books for children of all ages and Colgate University gave us over one hundred books. On the heels of this drive, through the months of November and December, we ran our Annual Toy Drive and thanks to the welcome assist from friend and follower Nora Steinman, who asked guests who attended her family holiday party to bring toys for the children of Pine Ridge, we were able to provide two schools and two communities with toys for their children. As always, a huge thanks goes to Re-Member, an outreach group on the Reservation, which partnered with us on many of our supply drives, collected donations and helped us get them around the Reservation. If you are interested in working on Pine Ridge we urge you to check them out! Thanks also go to the Scarsdale Congregational Church, in Scarsdale, NY, for continuing to support all of our efforts through donations of space, people-power, hosting events and, generally, for cheering us on. Below are some of the pictures from the various supply drives. Enjoy! Toys brought to a Holiday Party! 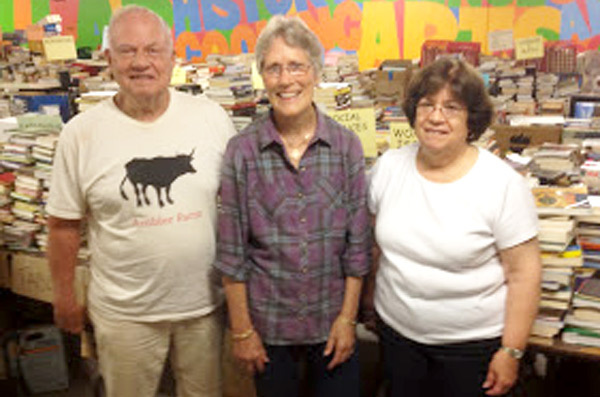 Volunteers from Wilton CT Library provided 3,000 books! Youngsters step up to help wash cars! 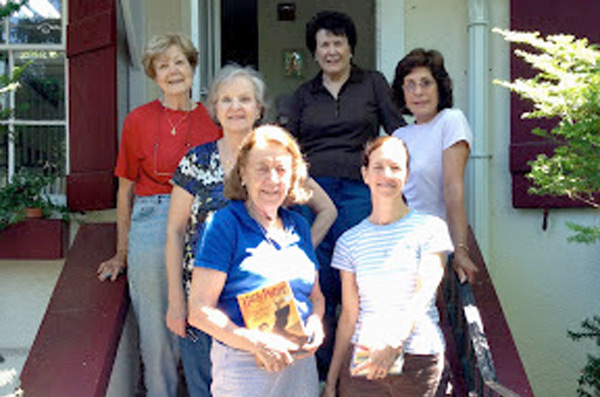 386 Books From Scarsdale Women's Club Operation Bookshelf! 2012 brought a new wave of creative giving programs; in fact, way too many to list. In February we were contacted by Mallory Knox on behalf of a consortium of artists from the US and Canada called “Art Knows No Boundaries.” Through online dialogue and votes they chose LCE as the beneficiary for their online art auction. This project was amazing fun and a spectacular success. If you really want to feel left out, then scroll through the amazing pictures on our blog post about the effort. See Art Knows No Boundaries. Awareness bracelets for sale! 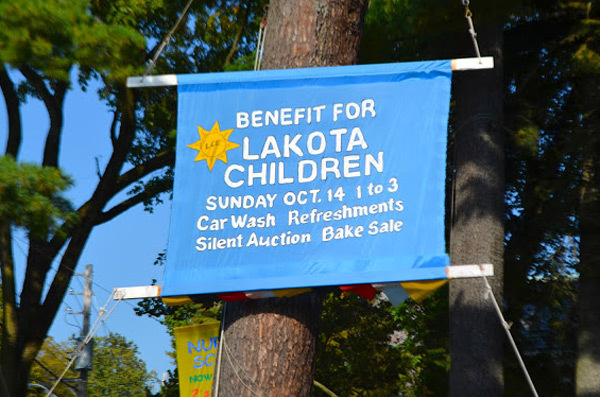 Hit us up at info@lakotachildren.org. The artists raised over $2700 for LCE in just two weeks, as they sold their artwork and showcased an amazing array of talent and charitable spirit. Through the auction, we met two artists who have continued to work with us to help the children of Pine Ridge. First, Elisabeth Barnes, began the production of bracelets to help raise awareness and funds for LCE. 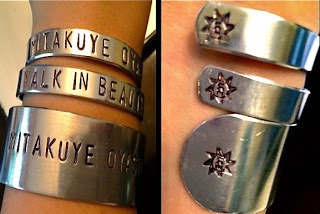 These bracelets, which say “Mitakuye Oyasin” and “All My Relations” will be offered for sale at a webpage near you soon (we are working on it). 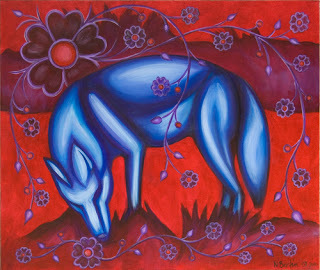 Another artist who participated in the auction, Katheryn Tracy, now is teaching Art at a Reservation School and we are filling her wish lists for Art materials for her school. As many of you know, the art, music and sports programs often are the first to be cut and teachers and students need additional materials and equipment. Romance author Sarah M. Anderson, who writes fictional novels with modern Lakota heros, continued her incredible support, by participation in our drives, contributions, and by encouraging all of her fans and followers to get involved, through Facebook, guest BLOG posts and Twitter. This year we heard from many of her fans as they gathered items for our Make A Difference Day effort. Along the way romance author Shiloh Walker (who writes under the name of J.C. Daniels) jumped in and engaged friends and fans in a real time shopping spree through Twitter! 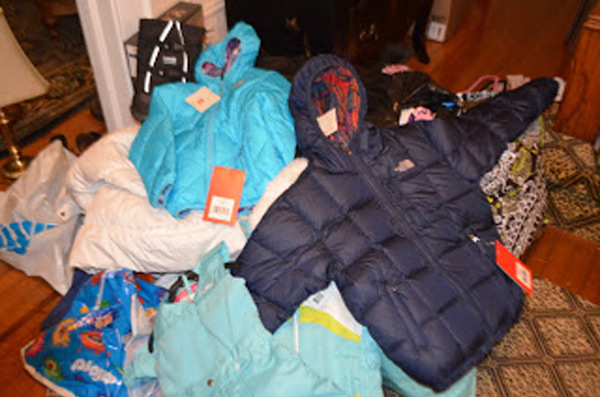 As she shopped, she posted pictures of what she wanted to buy, and got her friends and fans to contribute so that she could send a generous shipment of coats to the Reservation. Musician Steven Graves released a new album and pledged the proceeds of his White Buffalo song to LCE and other charities helping Native American communities. His goal is to raise $10,000 through the song. Check out his Website and the White Buffalo project – enjoy music and give back at the same time! A surprise delivery one day included a selection of autographed books from author Mercer Mayer, the author of popular children’s books that include the Little Critter Series. Mercer saw a post about our Make A Difference Day drive on Twitter, looked us up and asked us to forward the autographed collection to a Reservation school, which we did! 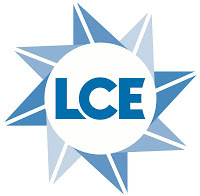 Numerous people donated birthday parties, holiday parties and other events to LCE. We heard from shop owners who contributed percentages of sales, and/or set up collection bins at their stores. Others donated items to auctions and events run by others. The list goes on and on. 2012 started out with a bang, as our Founder and President, Maggie Dunne, was named the Grand Prize Winner in Glamour Magazine’s Top Ten College Women Contest. Maggie, a student at Colgate University, was awarded $20,000 in prize money which she donated to LCE. The next week, Maggie found herself in a room with Richard Branson, Founder of the Virgin empire, she told him about her own donation to LCE, and he offered to match her donation as long as a Colgate Alumnus separately matched the donation. In the course of a few weeks, Maggie raised over $60,000 for LCE and was featured again in the August edition of Glamour Magazine, Indian Country Today and many more publications. Another big surprise came when Scholastic Books named LCE a Literacy Champion and featured us on its website and blog. Then, in its December Roundup, Scholastic Books named LCE one of the Top Five most groundbreaking Literacy Champions of 2012, recognition arising from our steady commitment to provide Reservation schools with books and to encourage children to read every day. At this point we have provided schools with more than 9,000 books, schools are building reading incentive programs and LCE is encouraging students to write through a writing challenge. We look forward to further developing our relationship with Scholastic in the future! 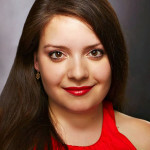 Also in 2012, Maggie Dunne was named a Midwest Regional Finalist for a Stay Classy Award – she was one of 5 Regional Finalists in the College Student or Team category. In addition, LCE was nominated by a fan and received a small grant from Chase Community Giving. 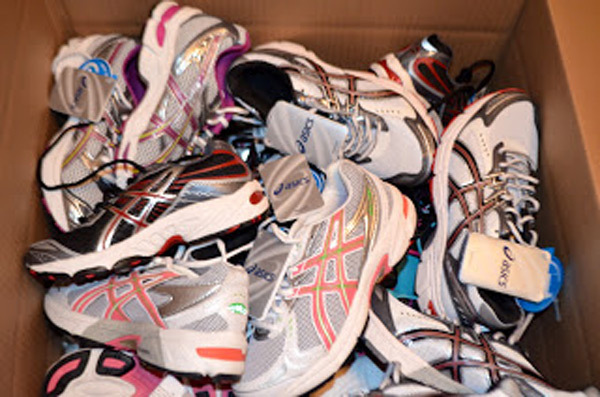 With your support we were able to provide the children of two schools with proper running shoes so they can in run cross-country events and participate in sports programs without getting injured. We made a greater effort this year to track our impact. Through partnerships with schools we have filled specific needs and also supported the efforts of teachers to keep their children excited about reading, learning and exercise. In addition, we have continued to educate the public about the obstacles facing the Lakota and other American Indian and Native communities. · became a certifying organization for Presidential Awards. YOU have Made a Difference; YOU can still Make a Difference! If you would like to see us do more in 2013, then please donate today.